Fans of Emperor Joshua Norton, San Francisco’s self-proclaimed "Emperor of the United States and Protector of Mexico," will mark his 200th birthday this Sunday. Joe Rosato reports. Fans of Emperor Joshua Norton, San Francisco’s self-proclaimed "Emperor of the United States and Protector of Mexico," will mark his 200th birthday this Sunday — kicking-off a month of exhibitions, lectures and a general nostalgia for the city’s most famous eccentric. Norton’s three-decades in San Francisco are burned into the pages of city history, even now inspiring bar and restaurant names, walking tours and a general fascination with Norton’s many forward-thinking proclamations. A photograph of Emperor Joshua Norton sits on display in the Society of California Pioneers as part of a bicentennial exhibit. "Some of them very prophetic such as a building a bridge across the bay or starting a league of nations for world peace," said Joseph Amster, an Emperor Norton impersonator who leads walking tours in San Francisco, "putting up a Christmas Tree at Union Square every year. Things like that." Norton’s gravestone in the Woodlawn Cemetery in Colma lists Norton’s birth year as 1819, but research by Norton-ites, which includes the discovery of his circumcision record in his native England, pin the date closer to February 4th, 1818. The evidence also includes a ship’s list from 1820 listing him as two years old, and a notice in the Feb. 4, 1865 Daily Alta California newspaper congratulating Norton on "commencing his 48th year." 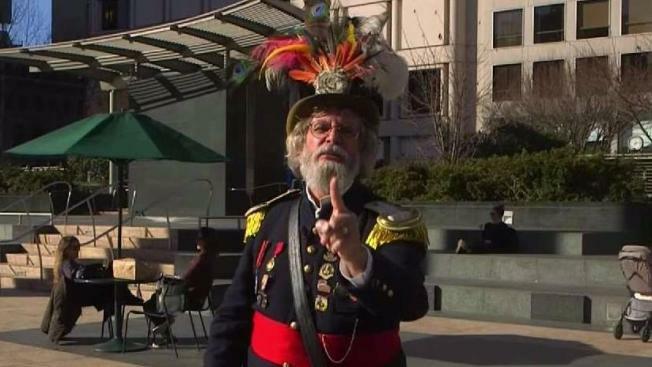 Joseph Amster in character as Emperor Joshua Norton for walking tours in San Francisco. "So all those things seem like a pretty good case," said John Lumea, founder of the Emperor’s Bridge Campaign, a non-profit group devoted to advancing knowledge of Norton. The celebrations of Norton’s bicentennial include a display of artifacts in the San Francisco Public Library’s History Center. Included in the exhibit is an 1851 bond with Norton’s own signature along with original caricatures of Norton from the period. There’s also a playbill from a 1957 ballet based on Norton’s life. A portrait of Emperor Norton in the Society of California Pioneers is the only portrait he’s believed to have posed for. "You know people are in love with the story of Emperor Norton," said city archivist Susan Goldstein. "He really caught the public imagination at the time and way back when, there were caricatures of him and depictions of him and it continues to this day." The Society of California Pioneers is displaying what’s believed to be the only portrait Norton ever posed for. The California Historical Society has its own display and an upcoming lecture by Lumea at the Mechanic’s Institute quickly ran out of tickets. All this for a strange man who liked to don himself in a military uniform and pontificate on the issues of the day. "Well this is a city that celebrates diversity, it celebrates reinvention," Amster said, "the idea that somebody can come here and reinvent themselves and become a totally new person." Norton was born in England and moved with his family to South Africa. He’s believed to have arrived in San Francisco in 1849 and amassed a fortune through real estate and commodities markets, eschewing the gold fields. But an attempt to corner the rice market proved his undoing, wiping out his finances and forcing him to declare bankruptcy. He remerged in 1859 assuming the position of emperor, which seems to have gone over just fine with the populace of the time. "He’d eat for free in restaurants, he had the best seats in the theater, people would actually rise when he made his entrance,” Amster said. “He rode transit for free, even printed his own money." After Norton collapsed and died across the street from St. Mary’s Church in California and Dupont (now Grant) Streets on Jan. 8, 1880, thousands attended his funeral. His possessions were taken over by city historians but burned in the 1906 Earthquake and Fire. Thus the celebrations of his 200th will focus more on his spirit than his ephemera. "In the 1860s and 70s, he’s calling for African-Americans to be able to ride streetcars, to attend public schools," Lumea said of Norton’s proclamations. "For the Chinese to have their testimony heard in court. For Native-Americans not to have their land stolen." In a city that celebrates its characters, Norton is the patron saint of eccentrics. Even 200 years after his birth, his life still strikes a chord in the city of San Francisco, which incidentally one of his proclamations opined to not call "Frisco." "We want people to remember Emperor Norton," Goldstein said, "and think about who he was." Find a list of Emperor Norton bicentennial events here.